Summer Village desirable cottage on Prime Lot!! amenties and activities to keep the whole family entertained. everything you need for a perfect vacation. You will find our cottage to be like no others in the village. We have customed designed our cottage. We offer high ceilings, granite countertops in kitchen with tile backsplash, tiled bathroom, custom lighting and a three season porch make our cottage a gracious and relaxing retreat. TV's & DVD player and a queen sleeper sofa in the living room. than happy to help assist you. We have been traveling to Wells Maine since 1991 with are 3 children, we love the coast of Maine and it beautiful beaches and that we are close to shopping and outdoor activities. When we past the bridge to come into Maine we just become so relaxed and look forward to staying at our cottage. Once you have gone to Maine you will never want to go anywhere else. We hope you enjoy your time while in Maine. Our property is one of kind to all the others in the complex. My husband being a builder and myself being a realtor we know what people expect. We have made our cottage into a luxury escape. We have customized all the light fixtures, painted every room, added tile backsplash to our kitchen and bathroom area. We have granite in the kitchen with all the amenities that a full kitchen needs. We also offer Wi-Fi in our cottage where most of them do not have that feature. I am very particular with my cleaning person that we have a top notch cleaning job when our guest arrived. We have been renting since 2007 and we have many return clients who have been very satisfied. Our cottage is located on a corner lot that has woods in our back. We also have decorated it for you so that you feel you are going into a luxury hotel. Once you stay at our cottage you will not want to rent from anyone else. Summer Village offers many amenities to their guests. We have 3 swimming pools in which 2 are heated. We have a pavilion for our weekend activities that the village offers during the peak summer months. We have many activities that the kids can do, like basketball, tennis, golf, volleyball, softball, and even a playground. There is pretty much something for all kids of all ages. We also have are own trolley right inside the village to take you to the main barn that has an arcade, sauna and workout room. You will not be disappointed at Summer Village if you are with a family or just a couple. Custom painted bathroom with new light fixtures and tiled bath. 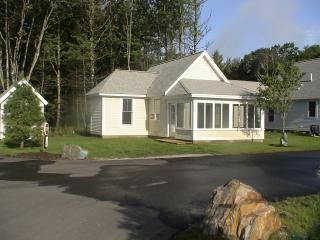 Our cottage is at a very desirable location on the property. We are approx. 500 feet to one of the main pool and recreation area. When you want to venture to the beach or nearby towns,catch the trolley right outside the entrance. Rented cottage at last minute and worried we had not looked closely enough at reviews. There was no need to worry. Cabin was exactly as described and pictured. Well appointed, clean, just perfect. Would definitely go back. We loved our stay and the property is wonderful. The management couldn’t be nicer. The owner is amazing and cooperated with our last minute plans. Her place was beautifully decorated and made us feel like home! Our family of three had a super time at Summer Village. The cottage was neat, clean and well-appointed. There were lots of children for our 5 year old to play with. We especially enjoyed being able to bike all over the property. Our son really strengthed his bike riding skills. Perhaps this summer he will go WITHOUT training wheels. We used the pools and the basketball court quite a bit. We were in close proximity to the many attractions in the York/Wells/Ogunquit area. We look forward to another week at Summer Village this summer. It is great for families. - Inside trolley to get you from your cottage to the main entrance. - Three swimming pools (1 adult only),plus two others. - Hot Tub near main pool. - Tennis courts,playground area,horseshoes,basketball,and volleyball. - Baseball field, 9 hole golf course and community fire rings. a great room to hang out. - Friday night outdoor movies with free popcorn.